I wanted to post a quick food report following the departure of my friend, Brian. 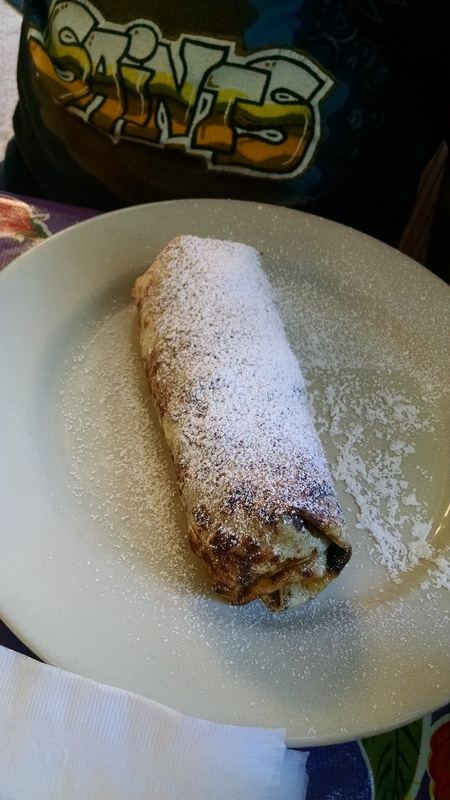 I don’t always post revisits to restaurants on my blog but I did want to give folks a taste of the places I take people when they come into town. It is the last night my friend is in town, so I went to the WWOZ LiveWire. This community supported radio station puts out daily lists of all the live, local music playing in this fair city. 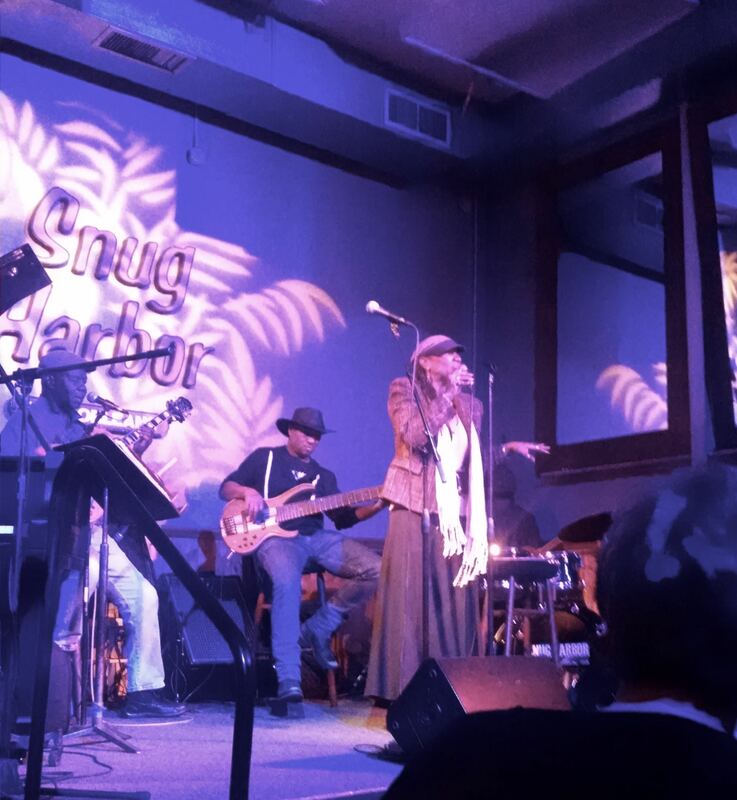 It was a Monday night but I found that Charmaine Neville was scheduled to play at Snug Harbor. 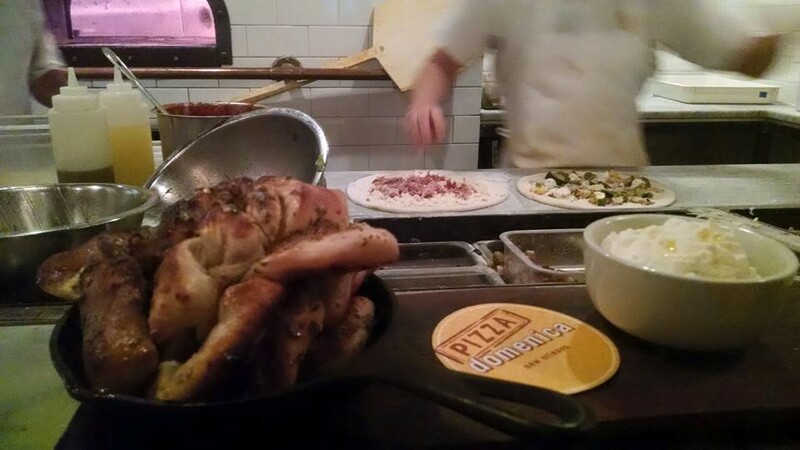 Excellent – good music AND good food. The Snug Harbor Jazz Bistro is on Frenchman Street in the Marigny and it offers nightly live jazz and a deep menu of local, regional favorites. 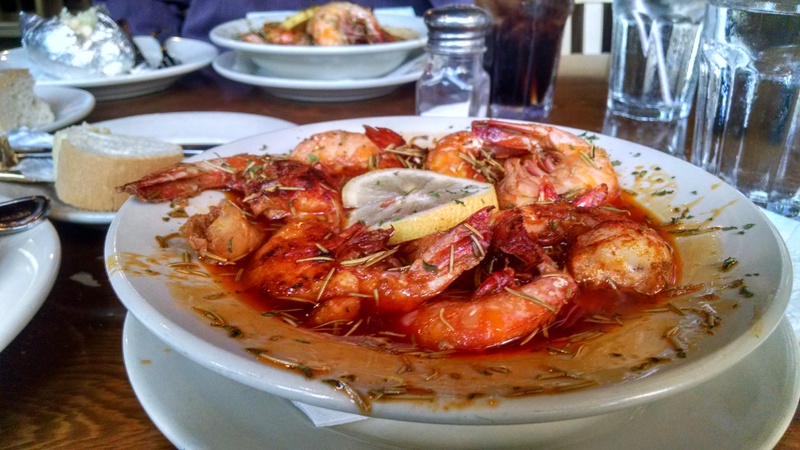 I relied on the advice of local food columnist Tom Fitzmorris and went for the BBQ shrimp. Lots of shrimp, piled high in the bowl with a couple of fresh loaves of crusty French bread for sopping up the juices. There is a little heat to the sauce but not too much and the shrimp were cooked perfectly to finger licking good deliciousness. The portions are large. There were so many shrimp, it was a struggle to finish but I persevered (and managed to eat a baked potato, too). The staff is friendly but low key and laid back. If you are planning to attend the show, you will want to come early. Our reservation was for 5:30 and we didn’t order appetizers or dessert and we finished and paid the bill at 6:56 (doors to the music hall opened at 7pm and seating is first come, first served). The band was terrific. Charmaine has a great voice and she invited a number of local musicians up to play or sing with her. There was also some audience participation but the show is great fun and you’ll be laughing and clapping and singing along. Driving back from the airport with a die hard Saints fan who flew in to help rally the Who Dat Nation during tomorrow’s home game against Atlanta. We stopped at Ye Olde College Inn on Carrolton for a dinner. They are open to 11pm on weeknights, so I knew we wouldn’t be rushed. The chef is a great believer in the local food movement – so much so that they have their own chicken coop and bee hives! We started with the BBQ Shrimp appetizer – two shrimp, sliced in half and covered in their version of BBQ sauce that more resembled a meuniere sauce. Tasty although the toasted slices of Leidenheimer made it a little challenging to sop up all the liquid. Brian went with the Fried Green Tomato Shrimp Remoulade Po-Boy. It didn’t really come together and the fried green tomato was such a delicate flavor that it was lost when eaten as a sandwich. 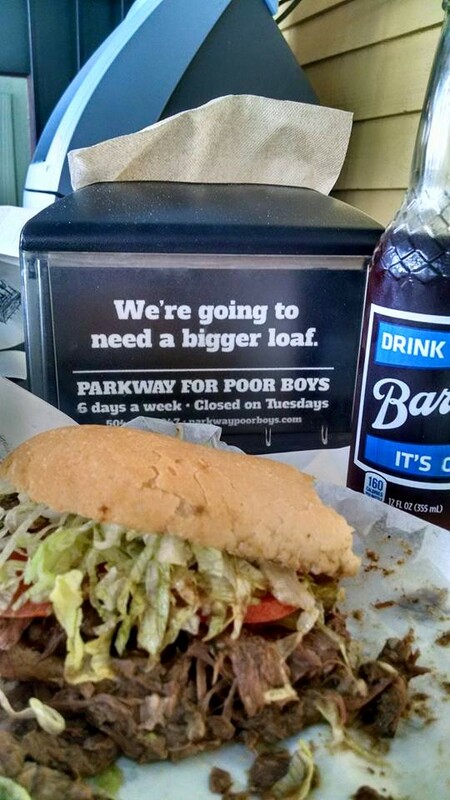 He ended up deconstructing the po-boy and eating it in pieces. I went for their special – the Million Dollar (wo)Man burger. 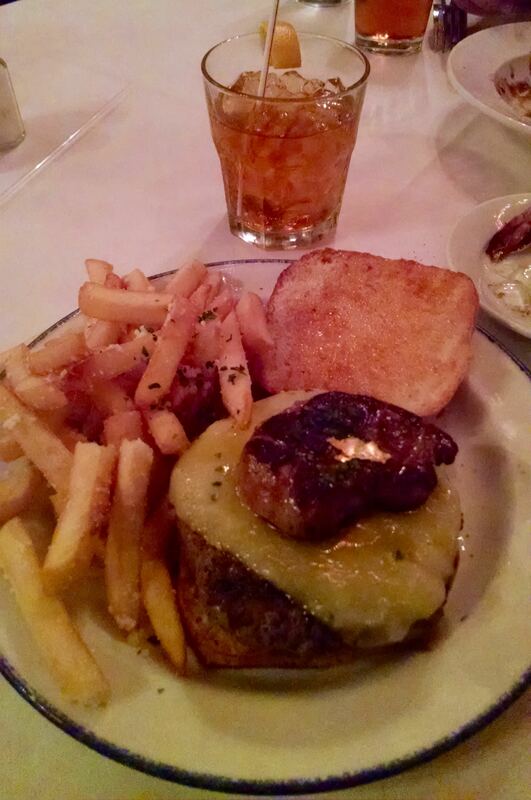 The tenderloin didn’t have enough fat on its own so they topped it with some seared foie gras, melted some Havarti cheese, slathered some honey on the top of the bun and placed a small piece of gold foil on top. I didn’t really see the point of the honey as it just made my hands messy and the sweet overpowered the foie gras. The burger itself was a trifle dry but still good to the last bite. It was served with truffle parmesan fries that were also tasty. 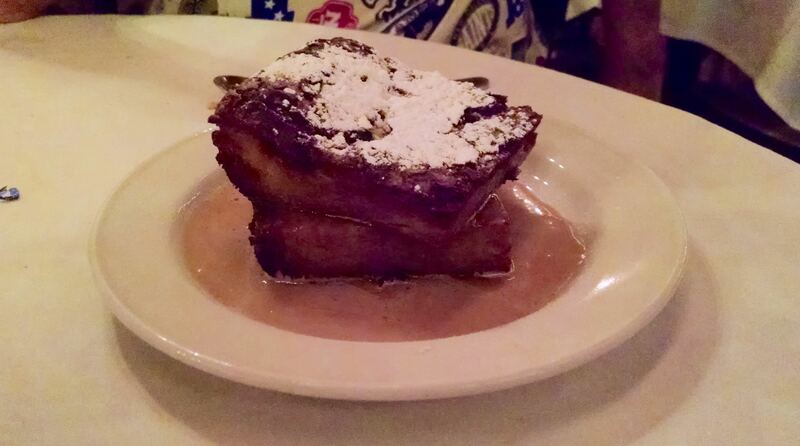 For dessert, we went with the deep fried bread pudding. This was awesome (even with the raisins)! We weren’t uncouth enough to lick the plate but we came pretty close. We had a very helpful server who knew the menu front and back and was quick with refills while allowing us lots of time to chat. I would keep this place on my radar – there was enough intriguing on the menu to give out of town visitors and locals good choices and I really like having a late dinner option. New Orleans has lost another culinary titan with the death at age 75 of Chef Paul Prudhomme after a brief illness. He popularized Cajun and Creole cuisine, including introducing the blackened craze. He was an author, a restauranteur, a television personality and a purveyor of spice. I was never a fan of chocolate covered pretzels, as the ratio of chocolate to salt to crunch was a little off. Then, I discovered Dark Chocolate Pretzel Bark Thins. Absolutely sensational. Life was good. I was slowly going broke to keep up with my addiction but, at least, I had deep chocolatey deliciousness to keep me company, right? Necessity being the mother of invention, I have now started on the path to make a version of it for myself. 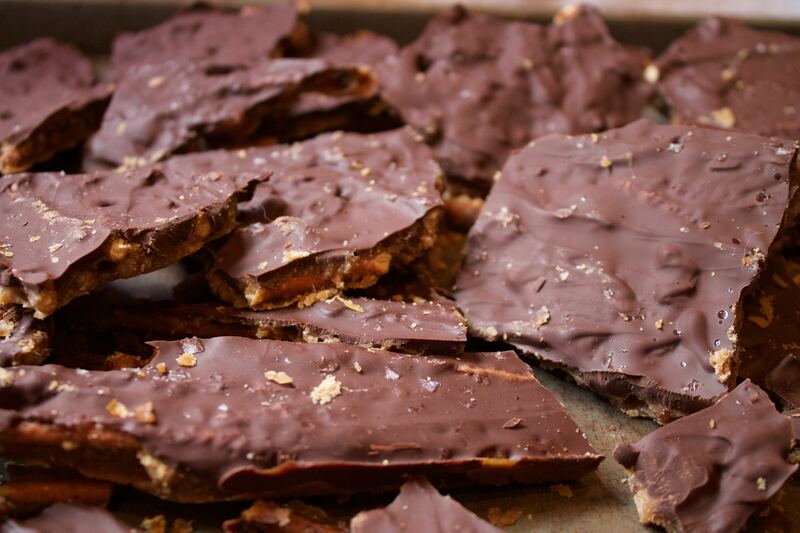 This particular experiment started as a saltine toffee recipe and I just went from there. Since it is a bit more sweet than chocolate or salty (pretty tasty, just not what I was going for), I’ll be going back to the drawing board. Cover a 15×10 inch baking pan with aluminum foil. In a single layer arrange the pretzels in the bottom of the pan. In a large saucepan melt the butter and add the brown sugar. Bring to a boil and boil for 2 minutes, stirring occasionally. Do not over cook the sugar. Carefully pour the sugar and butter over the pretzels. Bake for 10 minutes. Remove from the oven. Sprinkle the chocolate chips over the top. Let stand 5 minutes to melt, then spread the chocolate smooth. Sprinkle the flake sea salt over the top. Refrigerate for 1 hour. 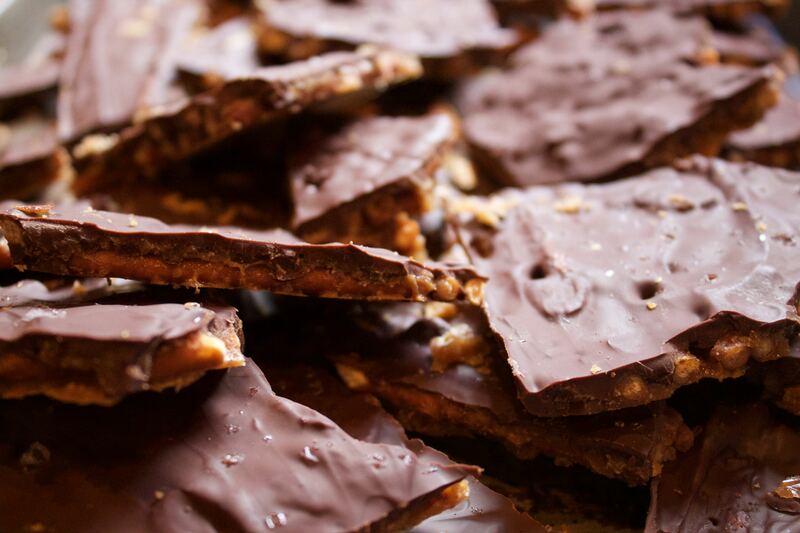 Pull foil away from toffee and break it into pieces. Like a lot of people, I like chicken wings. Buffalo style, honey BBQ style, Asian style, Caribbean jerk style, you name it, I like ’em. Unfortunately, they just aren’t that much fun to make at home as you have to make a lot to before you can even think of getting your fill. 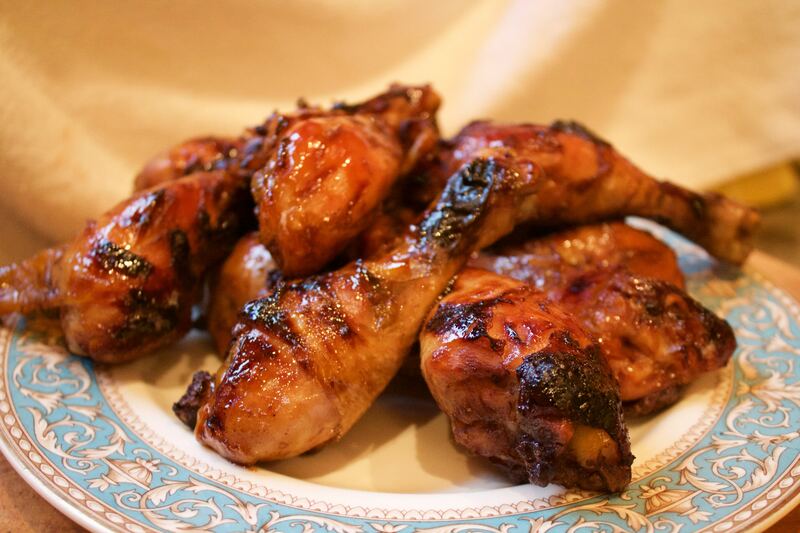 One way to overcome this, is to use your favorite wing recipe but substitute drumsticks. Much more bang for your buck, especially if you wait for a sale. This recipe cooks the chicken in the crock pot before finishing with the glaze under the broiler. Pomegranate molasses can be found at middle eastern and high end grocery stores and adds a rich color and tanginess to the glaze. Wash chicken very well. Don’t dry it off. Just layer the chicken in a 6 quart slow cooker. Sprinkle each layer with salt and pepper. Cook on low for 4 to 6 hours. The chicken won’t look like much when it comes out but check with a meat thermometer that the internal temperature has reached at least 160 degrees F. Now, it is time to start adding color. Place oven rack in the center of the oven and heat broiler. Place wire rack coated with vegetable oil spray over a foil lined baking sheet. Make sauce by combining honey, pomegranate molasses and hot sauce in a large bowl. Microwave for 30 seconds to a minute and whisk well. Toss chicken in the sauce before transferring to pan. Broil 5 minutes on that side. Rotate chicken and brush with more sauce. Return to boiler for 5 minutes. Continue until all sides have been basted and broiled, about 15 to 20 minutes total or until desired crispness. 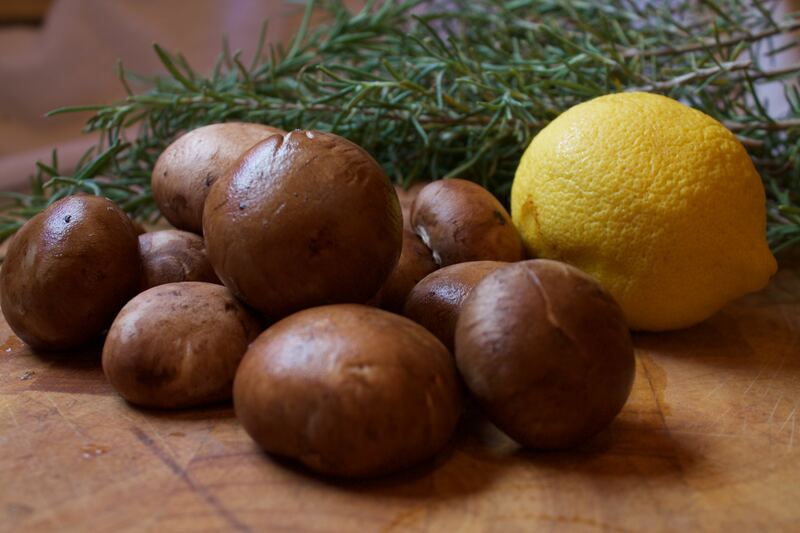 If you ever wondered if I cook anything besides meat with rosemary, let me share with you this mushroom recipe. It is great as a side for two or as starter, if you’re doing tapas. Start by doing a modified gremolata (parsley, lemon zest, garlic, salt). As Chef Marco Canora says: “Gremolata is like Italian MSG. It makes everything taste good.” Instead of parsley, I use rosemary. Combine the rosemary, lemon zest, and 1 garlic clove and chop to combine. Add a pinch of salt and mix well. Heat the oil and butter in a 12-inch skillet over medium-high heat. Cook the mushrooms with 2 garlic cloves smashed with the side of a chef’s knife. Season to taste with salt and pepper and cook, stirring occasionally, until the mushrooms soften, about 5 minutes. Pour in lemon juice and let it reduce by half, another 5 minutes. Take a large piece of parchment (or buy premade parchment bags from the grocery) and place the mushroom mixture in the center. Sprinkle the rosemary, lemon, garlic mixture over the mushrooms. Fold the parchment over the mushrooms and crimp and pleat the edges to seal tightly, starting at one corner of the fold and working your way to the other end, making sure the seals are tight. You can do this up to 2 hours ahead. 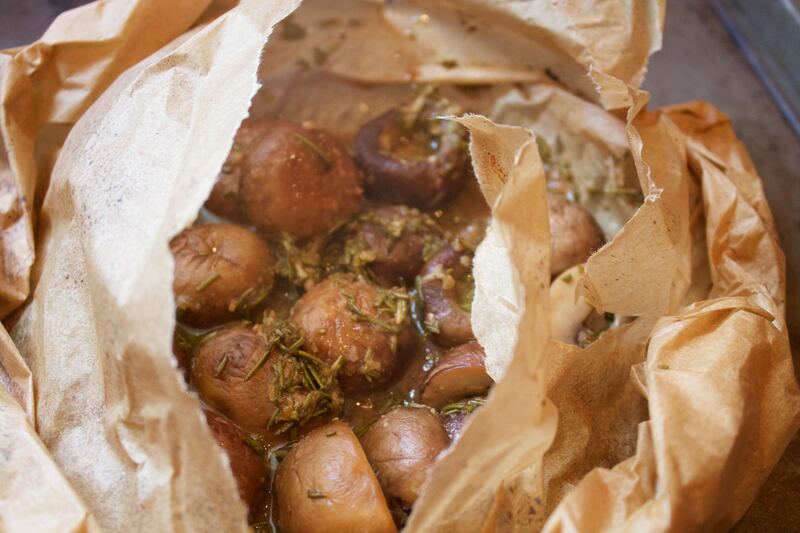 Put the packet on a baking sheet and bake until the mushrooms are warmed through, about 10-15 minutes. Slice open the packet and serve family style.